The Czech Republic (CZE) is divided. The liberal political right, which has more or less dominated public discourse since 1989, reiterates that we are living in the best of times. It forgets that a large part of the society gained little from the transition to a market economy, or was put directly at a loss. The loss is mainly connected to the erosion of social security and a fall into social degradation. A large part of the scholarly and scientific community and the cultural elites have been unable to pay attention to growing social problems. The church organizations and key non-governmental organizations mainly focused on giving paternalist assistance to the most vulnerable in the population and did not contests the view of social problems as a phenomenon that is determined individually. Such a reality of socially unequal development was also expressed by a growing distrust of vast sections of the society towards politics in general. This reality is exploited by a number of so-called new political movements that are closely connected to the oligarchic circles. On a programmatic or ideological level, they mostly promise guarantees – or mere promises – of a more dignified status of the lower and middle classes while increasing their attention to the population living outside of the main cities. In the Czech Republic the most pressing social issue is the degree of household debt and the frequency of debt-related property seizures, which affects more than 8 percent of the population. Aggressive by private collection agencies, initiating actions for often minor sums have deprived hundreds of thousands of people of their property and often forced them to the edge of the society or even into homelessness. Could it be the case that the Czech Republic has reached the Scandinavian level of development in terms of equality of men and women? If not, the planned transfer of resources from the field of gender equality makes little sense. Yet, the statistics and our position in international comparison indeed tell us the very opposite. Our society has a long way to go in terms of gender equality. But the leadership of Ministry of Labour and Social Affair is obviously quite content with the current state of affairs, since it plans to withdraw financial support for the promotion of equality of women and men in the labour market. Eurostat data sets the country’s pay gap at more than 20 percent, while at the same time the difference between men and women being able to find employment lies at 15 percent. When the democratization process started, quarter of a century ago, the Czech Republic hoped to raise its social, environmental, economic and legal realities to “First World” standards. The Czech Social Watch coalition concluded in its alternative report to the United Nations that “we are back in the Second World”. The chapters on People, Planet, Prosperity, Peace and Justice and Partnerships provide evidence of an increasing gap between East and West in Europe. “Apart from indisputable internal responsibility, international cooperation has been lacking and it is not surprising that trust in the EU is decreasing in new member states”. The report complains about underrepresentation of Eastern Europe internationally and sees “ethnically motivated murders of Czech and Polish workers in Great Britain by neo-Nazis in connection with Brexit” as “only the tip of the iceberg”. Czech women are two times more likely to fall into poverty than men. This gap is particularly pronounced among the elderly and single-parent families, notes the Czech branch of the Social Watch network in its report published on the occasion of the International Women's Day. In the Czech Republic, women are responsible for 87 per cent of single-parent families, with an estimated total number of 180,000. Nearly 20% of these families with one parent are at risk of poverty. Mothers without a spouse often have low incomes and are twice as likely to be unemployed than the national average. The Social Watch Coalition in Czech Republic launched the report on gender equality concerns itself with two of the most serious issues of today – firstly, the feminization of poverty (the status of single mothers and female pensioners) and secondly, the violence suffered by women and migrants. Czech women are two times more likely to fall into poverty than men. This gap is particularly pronounced among the elderly and single-parent families, notes the Czech branch of the Social Watch network in its report published on the occasion of the International Women's Day. In the Czech Republic, women are responsible for 87 per cent of single-parent families, with an estimated total number of 180,000. Nearly 20% of these families with one parent are at risk of poverty. Mothers without a spouse often have low incomes and are twice as likely to be unemployed than the national average. The Czech Social Watch report launched last week in Prague recognizes achievements by its government in social policies, but also criticizes lack of progress in environmental issues. The Czech Republic supports peace and the Sustainable Development Goals, but on the other hand it stimulates arm exports and blocks developing country participation in international fora on tax havens and illicit financial flows. Although the Government generally supports the SGDs and the engagement of non-state actors in the planning process, some governmental departments fail, or in some cases, even refuse to take seriously the 2030 Agenda for Sustainable Development. Social Watch finds much to criticize in the Czech Republic, sees rising intolerance. Last year, the Czech Republic managed to overcome economic stagnation, but many people in the country are imminently threatened with poverty, according to the annual report that its authors from the Social Watch international network’s Czech branch presented today. Islam and immigrants became new targets of intolerance, while public expressions of hatred of Romanies were less frequent compared with previous years, the report on the situation in the Czech Republic in 2014 says. Though the Czech Republic has a new strategy of promoting equal opportunities for women and men, the implementation of particular steps is stagnating, the report adds. 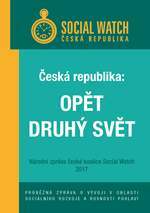 On 30th July 2014 the Czech Social Watch Coalition released the new National Social Watch Report summarizing the development in the year 2013. The title of the report is Czech Republic: Chaos and incompetence in the next year of crisis and it focuses on social development and gender equity, particularly in the following areas: economics, women in politics, social and accessible housing, Roma minority, the lack of community work and human rights agenda in the Czech foreign policy. The publication includes an additional article about the Czech arms export, which is called Czech Republic again equipped dictators with arms in 2013. The Czech Social Watch Coalition released the new National Social Watch Report summarizing the development in the year 2012. The title of the report is Czech Republic: Decline and Resignation and it focuses on social development and gender equity, particularly on the following areas: economics, family and social politics, Roma minority, gender and environmental issues. The year 2012 was not a good one for most inhabitants of the Czech Republic. In 2012, the country still did not reach the level from 2008 and the gap between the neighbouring countries is widening. The government had no vision and positive economic programme, "fiscal consolidation," which meant budget cuts, was its only objective. One-fifth of the working people are endangered by poverty, more women than men. Absence of an effective conception of social housing also represents a problem. Forced moving of people into overpriced unsuitable dormitories didn’t help to solve the situation and only supported further ghettoisation. Therefore trivial personal conflicts, in which Roma people often find themselves, lead to big anti-Roma demonstrations and attempts of pogrom. Last but not least corruption is big and visible problem of Czech politics as well. Achieving food security as a common responsibility of the South and North, promoting decent work and providing electrification for all by 2030 at the national level: those are the focuses of attention of a broad non-governmental alliance created in the Czech Republic against poverty. To achieve them, the Czech Social Watch coalition thinks it necessary to rebuild the financial architecture at the global level. Conditions of life in the Czech Republic worsened last year, but the Government is persisting with policies like those that led Greece into its current crisis. This bleak analysis comes from the fifth annual report by the country’s Social Watch coalition, which also questions the budget cuts that have been made and highlights their negative impact on families and on the national economy. Other critical points it examines are political corruption, tax evasion, gender inequity and serious deficiencies in environmental protection. In terms of gender equity the Czech Republic places itself at the European average, but below some of its neighbours.